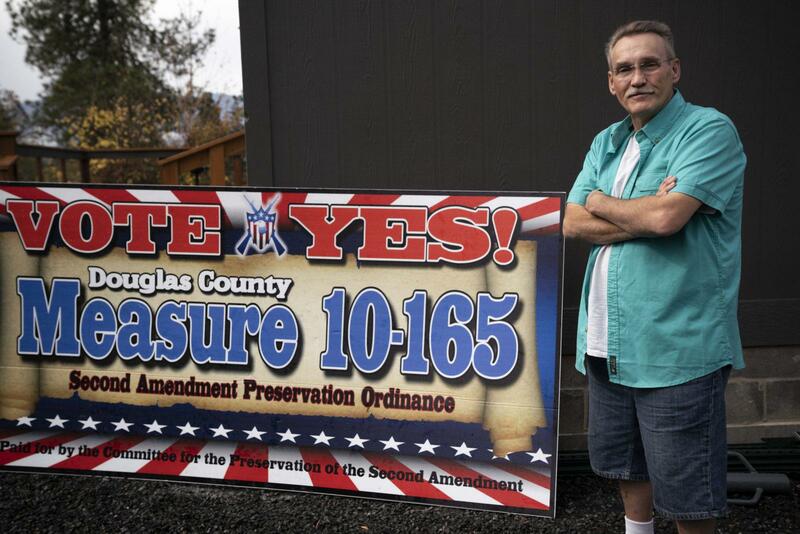 Tom McKirgan stands in front of his house in Camas Valley, Oregon, with a campaign sign supporting the Douglas County Second Amendment Preservation Ordinance. McKirgan, a member of the Oregon chapter of the Three Percenters militia group, helped draft the Douglas County ordinance. A new kind of gun law is on the ballot in 10 Oregon counties this year. So-called “Second Amendment Preservation Ordinances” would give those county sheriffs the authority to determine if state and federal gun laws are constitutional and bar county resources from being used to enforce them. The measures represent a new legal strategy for gun rights groups. Taylor runs the Committee to Preserve the Second Amendment. The group wrote and shepherded the ballot measure to Election Day with the help of the Oregon chapters of militia groups like the Oath Keepers and the Three Percenters. The proposed ordinances are based on the same 10th Amendment principles that sanctuary cities use to justify not enforcing federal immigration laws, Taylor says. The 10th Amendment, which defines the relationship between the state and federal government, affirms the principle that any powers not granted to the federal government would be reserved to the states or the people. “We thought if a state can do that with the 10th Amendment, why couldn’t a county do that against the state using the same type of anti-commandeering principles,” Taylor said. 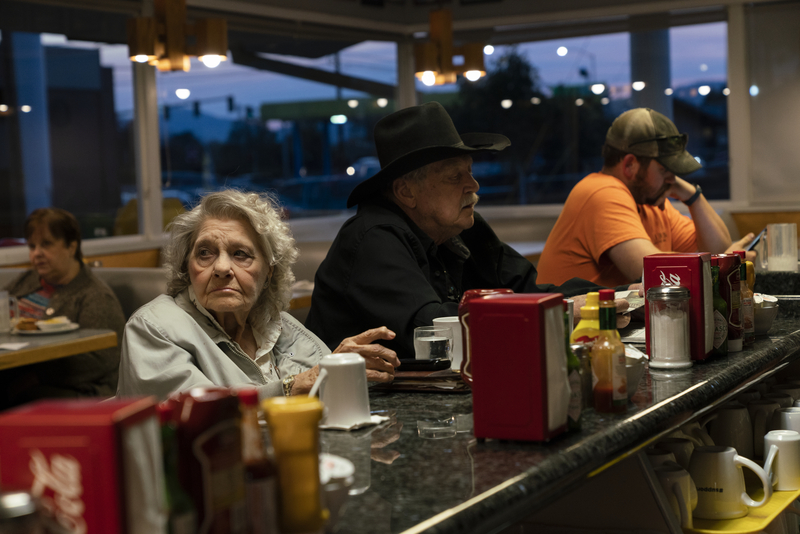 Delfa and Richard Middleton eat at Casey’s Diner in Roseburg, Oregon. They’ve always owned guns but didn’t yet know how they’ll vote on the Douglas County Second Amendment Preservation ordinance. In a state where Democrats in Portland and Salem have used their control over all the major branches of government to push stricter gun laws, giving local officials control over enforcing the laws could gain traction with conservative voters. Taylor says people from California, Utah, Iowa and Pennsylvania have reached out to him about proposing similar initiatives in their counties. Local members of the Three Percenters and the Oath Keepers militia have been organizing the effort across the state. Tom McKirgan, a member of the Oregon chapter of the Three Percenters militia group, is the Southern Oregon coordinator for Taylor’s Committee to Preserve the Second Amendment and helped draft the Douglas County ordinance. He says the ordinances are necessary to stop what he calls over-reaching gun laws passed in Salem. The Three Percenters are typically skeptical of government overreach. But when asked if these ordinances give too much authority to the county sheriff, McKirgan says police officers already make those choices as part of their job. A sign urging Douglas County voters to support the Committee to Preserve the Second Amendment on the side of the road. “Every police officer makes that decision every day of their career: whether or not something is constitutional,” McKirgan said. Other law enforcement officials say that is true: They determine if a law has been broken, which is an interpretation, but the decision ultimately falls to the courts to decide if they’re right. And those same courts may decide these ordinances are illegal. Oregon state law says all gun legislation must be made at the state level. In 2013, the Kansas legislature passed a similar law trying to circumvent federal gun laws — only to have it quickly struck down by federal courts. Many of the sheriffs who would be affected by the proposed ordinance if it passes are supportive of it. But they don’t take the ordinance literally. Douglas County Sheriff John Hanlin in his office in Roseburg, Oregon. Sheriff Hanlin says he supports the Second Amendment Preservation Ordinance on the county ballot. 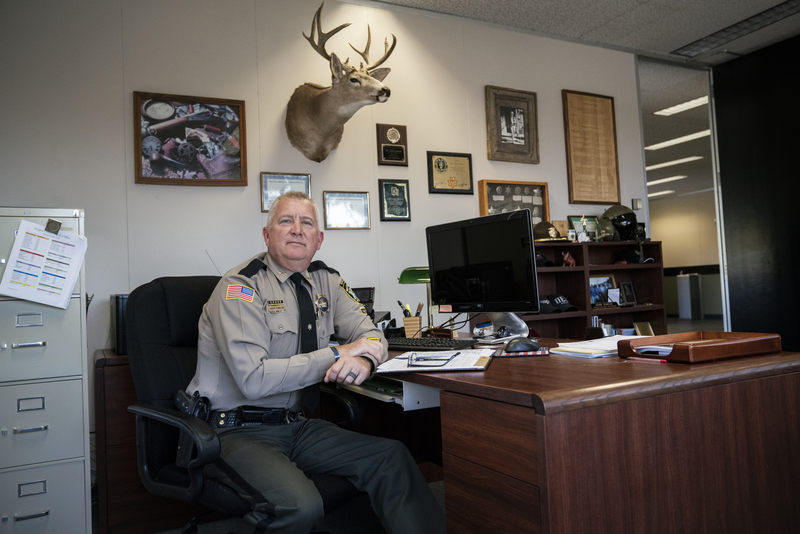 While many big city sheriffs often play second fiddle to their police chief counterparts, in rural areas the sheriff is the top law enforcement officer. Everyone in Southern Oregon’s rural Douglas County knows Sheriff John Hanlin. Hanlin says the ordinance is more of a message to lawmakers in Salem. Tatiana Resetnikov, an activist in Douglas County, is trying to mobilize voters across the state against the preservation ordinances. Resetnikov is a Republican and says she supports the Second Amendment. After taking a closer look at this ordinance, Resetnikov says putting so much power in the hands of one person — the county sheriff — makes her nervous. 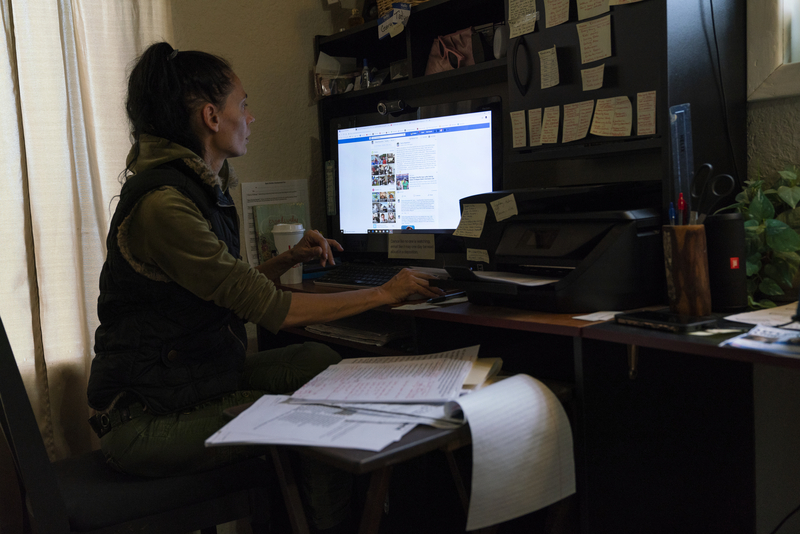 Tatiana Resetnikov scrolls through the newsfeed of Douglas County’s Second Amendment Preservation Ordinance in her home on October 25, 2018, in Winchester Bay, Oregon. Resetnikov is an activist organizing opposition to the proposed initiative. In 2016, Three Percenters were among the militias present during the 41-day occupation at the Malheur National Wildlife Refuge in eastern Oregon. They claimed they were there to protect the population and act as intermediaries between federal law enforcement and the occupiers. 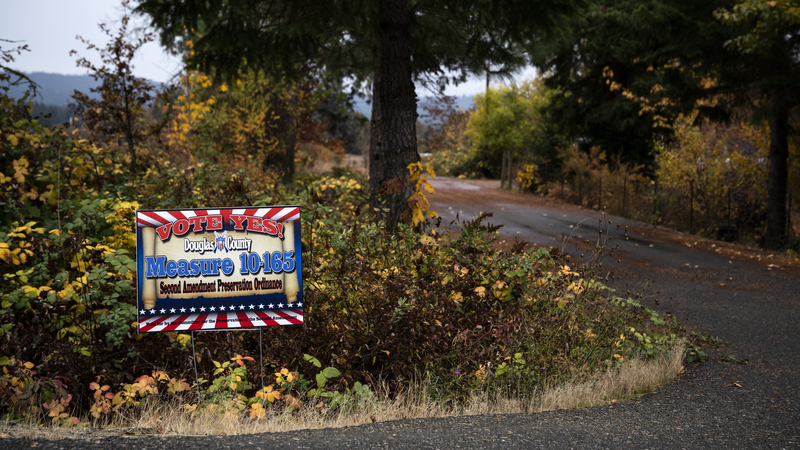 At his home in rural Camas Valley, Tom McKirgan with the Three Percenters militia group says despite what people think, his fellow militia members aren’t maniacal or fanatical. He says they’re focused on protecting individual rights. Rob Taylor of the Committee to Preserve the Second Amendment says he hopes to see this strategy being used across the country and expects to see similar ordinances nationwide regardless of what happens Tuesday in Oregon. Update 11/7/2018 2:18 p.m.: Tuesday night, eight out of the 10 Oregon counties voted in favor of Second Amendment Preservation Ordinances. Two of the 10, Jackson and Lincoln counties, rejected them. With Democrats winning super majorities in both houses of state government as well, restrictions on semi-automatic rifles and high capacity magazines are likely back on the table. And in eight Oregon counties, including Douglas County, sheriffs like John Hanlin may soon find themselves torn between state law and the will of the voters who elected them.